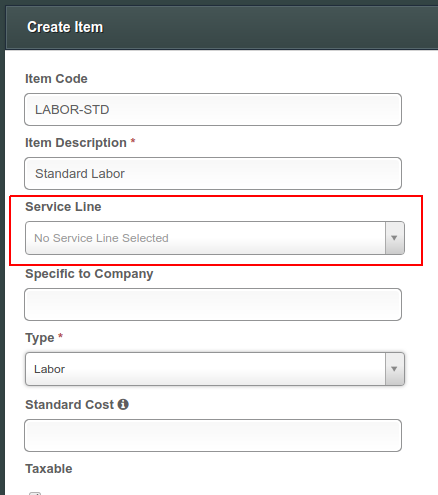 Previously, each item on your item list in ServiceTrade was required to have a service line. However, some items created by ServiceTrade users are common across many service lines -- labor, generic parts such as pipe and cabling, fees, etc. This allows you to use a single item -- in this case, 'LABOR-STD', for jobs across your organization. IMPORTANT: When you use one of your item list items on a job, quote, or invoice, you still must choose a service line. For instance, if you were to add the 'LABOR-STD' item to a job, you would have to specify the service line for that particular use of LABOR-STD, because on this particular job you know what sort of work this labor is associated with (HVAC, sprinkler, etc). This in turn allows you to organize your job and quote data by service line to perform cost and revenue analyses, manage your margins, and so forth. You can now use ServiceTrade to organize your invoice line item data in QuickBooks Desktop using Classes. These classes then allow you to create more fine-grained reports in QuickBooks to analyze your financial performance. IMPORTANT: You must enable class mapping in QuickBooks Desktop to make use of this feature. See the help documentation for your version of QuickBooks Desktop for more information on enabling Classes. The class names that you choose in QuickBooks must exactly match the job type, service line, or item type in ServiceTrade. IMPORTANT: This feature is available for QuickBooks Desktop only, not QuickBooks Online.